We're back with more Easy Art Projects for Kids, an art series we are doing along with several of our favorite kid bloggers. So far we have made erupting watercolor absorption art while exploring with watercolors, and tape resist art on foil while exploring resist art. The theme for today is crayon art. We love melted crayon art, and I have been wanting to try this method of melted crayon art for some time now! I would love to claim credit for this genius idea, but I saw it somewhere years ago and put it on my mental to do list. First we peeled our crayons using this simple trick to peel crayons quickly. Once the crayons were ready I heated up the glue gun and covered our work space with an old towel to catch any splatters that missed the paper. JZ (6) is obsessed with both melted crayon art and glue guns, so this combination of two of his favorites had him jumping up and down with excitement to begin. The crayons need to be guided and gently pushed through the glue gun. The trigger will not move them along like it does a glue stick. This art project requires a bit of strength. JZ was about to do it, but even he needed help upon occasion. As the glue is pushed through the hot part of the gun it melts and drips or splatters out onto the paper. We discovered that we could push on the crayon to really make it splatter out of the glue gun, resulting in beautiful crayon drippings. As each crayon is pushed through, we used the next crayon to push it farther into the gun. Gentle force must be used to avoid breaking the new crayon. Crayon pieces could be used instead of whole crayons, but it would require a bit more effort since getting a new crayon started was the hardest part of this process. My favorite part of this art project was seeing the different color palette each time a new crayon was added. J-Bug (4) made his own melted crayon art masterpiece. He needed quite a bit of help to push the crayons through the glue gun. He discovered that he could draw lines and shapes by pressing the tip of the glue gun against the paper. I love the look of the crayon drippings right when a new color was added. The way they melted together was very pretty. 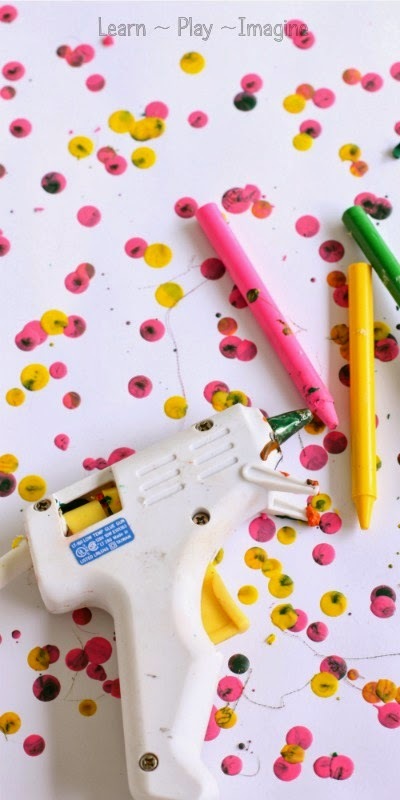 Please note: Your glue gun will be ruined after this art project. I used an old, cheap glue gun, and now it is set aside strictly for melted crayon art. Also, I hope this goes without saying, but please supervise children while using a glue gun. JZ and J-Bug have used glue guns many times and understand which part is hot and how to set it down when not in use. Even still, I did not leave them alone during this project. Be sure to check out all the ways to explore crayons! This is just the most awesome idea EVER! I love how excited your boys got. So much fun! And I love the color! 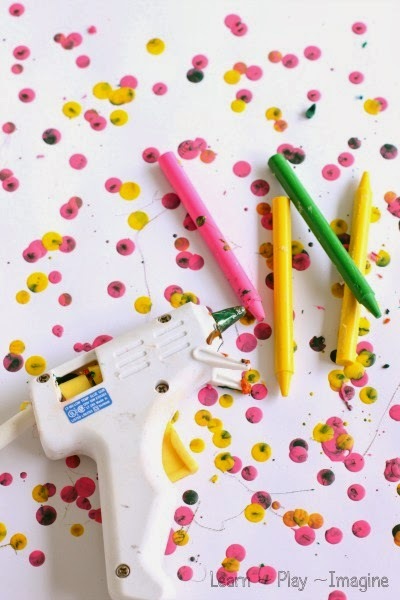 Can you clean your glue gun out by passing a few sticks of hot glue through it? I can't stop thinking about what fun this would be to try! Thanks for the super fun idea and a glimpse into your fun! This is genius! My 6 year old is going to LOVE this :) We haven't melted crayons in a while, and how could a boy not have fun using a "gun!" Aw, this looks super fun!! And Wal-mart has glue guns for under $4...totally worth it!! How do you clean your glue gun? Or is this a "dedicated" glue gun? How beautiful! Wish the glue gun wouldn't be ruined after. I'll have to look for a used one we can use just for something like this! soo cool!!! Have to try this! We have been using this idea in my classroom for a few weeks with no issues working on a major project. Today a crayon exploded and the liquid backsplash landed on a student's face and in his eye. Luckily the damage was minimal (eventually his mom was able to wipe it off with warm water and a facecloth) but it could have been terrible. It scared me and won't ever do it again. If you are doing this, I recommend goggles. Thanks for letting us know this!